This felt oddly disjointed to me until I found out that it was originally published as two separate stories and then it all made sense. Well, maybe I wouldn't go that far but at least I understood why it felt like two halves of a whole. The first half of the book starts when Tarzan gets caught up with a refugee from yet another lost civilization. No one could accuse Edgar Rice Burroughs of not draining that well down to the last drop. This time around the two warring cities (aren't there always two warring cities, too?) are run by twin brothers who use magic gems to telepathically control the residents. Tarzan's rescue goes wrong when the refugee gets pulled back by the magic of the gems and he follows after. He gets captured, something that always worried me when I was a young teen reading these but now I just roll with because he always comes out on top and his captors always rue the day. It's part of why I love the books. This civilization is an odd departure from ERB's typical lost whites because this has African women who have been stealing and mating with white men to try to become white - an explanation for which is never given. 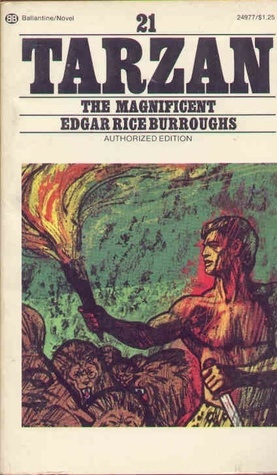 Edgar Rice Burroughs loved to explore and talk about genetics but had the early 1900s prejudices and racism so firmly entrenched that he seems unaware of his own bias. It makes me wonder what unconscious biases my writing divulges. Wait, don't tell me, I do NOT want to know. Our refugee, Stanley Wood, is in love with one of these women, the queen Gonfala, and believes she's in love with him. There is a catch, however, she is in some tiny part a "black" girl and that is a problem in ERB world. The fact that she's blonde and fair skinned and any tiny proportion of African genes would be miniscule after so many generations doesn't change the fact that, as far as ERB and his characters are concerned, she's not white. A character in the book points out that Stanley can't marry her because prejudice back in the states would be too strong. It's ironic that ERB is so blind to his own racism while calling out others for the same thing. Anyway, adventures ensue and Tarzan's muscle and mind are pitted against the might of the magic gems. Of course Tarzan is immune to their influences and everyone who matters (meaning anyone white) is rescued and returned safe to Tarzan's bungalow where they presumable meet Jane although she doesn't make an onscreen appearance. About this time I thought this was going to be the shortest Tarzan book ever (I was listening to it and had no idea how much was left) but then Gonfala is kidnapped and the second half of the book kicks off. This leads to something unusual for a Tarzan book - a return to a previous location. Other than his birthplace, his bungalow, and Opar, Tarzan rarely retraced his steps. But this time they end up, through adventures that are hazy in my memory, back in the City of Gold from the book Tarzan and the City of Gold. It was good to see some of the people from the earlier book even though the plot was even more tortured than usual. Captures, rescues, and treachery abound until everything gets resolved, including the matter of Wood and Gonfala's relationship. This was not one of my favorites, even for the later books. It's pretty typical later Tarzan with silly coincidences and lots of running around without making any progress. The first half of the book is stronger than the second half when ERB couldn't even be bothered to do any new world-building. The whole thing feels even more lazy and deriviative than usual, and for ERB that's saying a lot. Don't get me wrong, I love my Tarzan, but this is not one I would recommend to anyone but a true fan or a completist. Three stars at best and that's with the Tarzan uplift.